Woodley Gardens Day Nursery Prices. Full Time and Part Time Rates. If you wish your child to be considered for a place please complete the basic ENROLMENT FORM which serves merely to express your interest and requirements. There is no charge for being on the waiting list and you will be contacted as soon as we are able to confirm a place for your child. 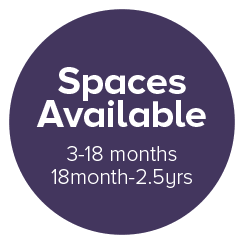 We do fully intend to fill places from the waiting list but priority may be given to parents requesting: an immediate start, as we have to ensure places are filled as soon as possible; to families with more than one child wishing to attend the nursery, and to parents requesting full time places. We will contact you once we can confirm a place for your child. We will then send you a PLACE OFFER LETTER with a request for £50.00 registration fee and the deposit. The deposit will be £100.00 per day of attendance to be paid, for example if your child will be attending 3 days per week your deposit will be £300.00 + the £50.00 registration fee. The deposit will be refunded back to you when your child leaves (this is subject to your account being settled and that you give one months notice in writing). The registration fee of £50.00 is non-refundable. Both the registration fee and deposit are non-refundable should your child not start the Nursery. We require a detailed registration form and agreement form to be completed. Once we receive these 2 forms, copy of your child’s birth certificate and the deposit we will secure a place for your child. We will then send a standing order mandate for you to complete, which will need to be set up for the day that your child joins the nursery and for the 1st of each month following. It is advisable for you to arrange approximately 3 short pre-arranged visits usually for the week or two prior to your child starting their first day at Nursery. This is a good time for you to meet the staff, feel at home with us and complete our ADMISSION FORMS stating your child’s current routines and requirements. Fees are calculated over 52 weeks of the year. Weekly amount multiplied by 52 and divided by 12. Please note that we do not offer ‘term time only’ or ‘funded only’ places. You can of course use funded hours with us but it needs to be in conjunction with additional self funded hours. All of our staff are highly trained, providing the highest standard of professional child care and education. Before each member begins their employment, they are thoroughly vetted in accordance with OFSTED. We are all dedicated and committed to giving your child individual attention, so that their social, emotional and intellectual aspects are fully nurtured. Our extensive number of policies can be seen in the Nursery Entrance Hall. All of our policies are available for parents to read. We are regulary inspected by OFSTED and Environmental Health.We endeavor to ensure our staff remain in line and up to date with these practices.